The Décor : Festive décor is a must for the right vibes around any festival. Go for simple props as a display e.g gulal in chai glasses – It will set the mood at the entrance itself. You can string up bright balloons and paper ribbons all around. Colorful flowers will further add to the life of the occasion. 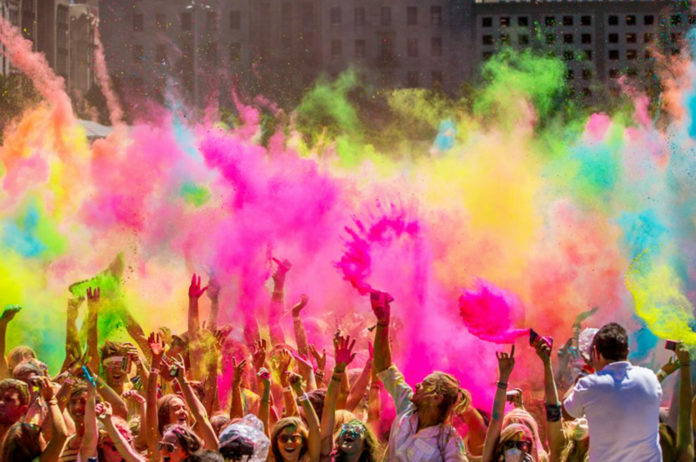 Food, food and more food : Holi is associated with food as much as it is with color. Well, that’s how most Indian festivals are J If you are fond of cooking, this is the time to make some lip smacking sweets, particularly gujiyas (Sweet dumpling made with flour and stuffed with khoya). If you are fond of eating like me, the choices are never ending. I always wait for Holi to get the best of food throughout the day gorging on sweets and savories in all the meals. Colors for the kids: I am sure there would be many over protective moms like me who wouldn’t want their kids to play with colors but I am definitely not averse to the idea of introducing the concept of having fun with colors. While V is too small to even understand the art and craft, I plan to help her with few splatter cards and coloring books. Looks like fun, let’s see if she really enjoys it. Photo shoot – What a wonderful occasion to get few pictures clicked. You can make it a day to remember using a blank wall and a variety of props such as rainbow wigs, outsized sunglasses, multicolored hats, and colorful boards. Also, don’t forget a pile of masks and pouts to add to the fun. Forgive and forget – Did you know the festival of Holi is actually a day to forgive and forget, and to try and end conflicts. So, make peace amongst your groups and people you do not get along with. Chance to dress up : The traditional dress code for Holi has always been white but if you want to celebrate the festival with colors on your clothes, you can dress up in the brightest of colors and enjoy the color blast. Go for a theme: Themes in parties are always fun. A good theme can take a boring gathering to a legendary party.Go for funky themes or a floral theme where the décor to your dresses, everything is filled with flowers. Never underestimate the power that bunches of colorful fresh flowers wield.